Anvil 100% Ring Spun Cotton Long Sleeve Hooded T-Shirt Style 987 is a light weight great looking hooded tee. Perfect for that pre-game tailgate BBQ. It is available in the following colors: Black/ Dark Grey, Heather Blue/ Neon Yellow, Heather Dark Grey/ Dark Grey, Heather Green/ Neon Yellow, Heather Purple/ Neon Yellow, Navy/ Dark Grey and White/ Dark Grey. 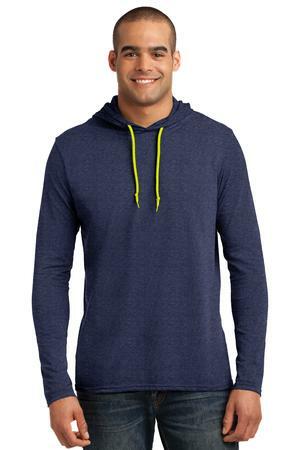 The Ring Spun Cotton Long Sleeve Hooded T-Shirt Style 987 is a light weight great looking hooded tee. It is available in men’s sizes S-3XL and comes in the following colors: Black/ Dark Grey, Heather Blue/ Neon Yellow, Heather Dark Grey/ Dark Grey, Heather Green/ Neon Yellow, Heather Purple/ Neon Yellow, Navy/ Dark Grey and White/ Dark Grey.